Use for correct the camshaft and crankshaft timing position. Applications: 2006~2013 VAG series TSI, TFSI EA888 engine(1.8L, 2.0L). BYT, BZB, CABA, CABB, CABD, CADA, CAEA, CAEB, CAWA, CAWB, CBFA, CCTA, CCZA, CCZB, CCZC, CDAA, CDAB, CDHA, CDHB, CDNB, CDNC, CDND, CESA, CETA, CFKA, CGYA, CJEB, CJBA, CJSB. T10352, T10352/1, T10352/2, T10368, T40196, T10354, T10060A, T40011, T40098, T40267, T40271. TIMING DEVICES FOR AUDI, SEAT, SKODA AND VOLKSWAGEN ENGINE - ZIMBER-TOOLS. 3-piece Engine Timing Tool Kit for VW-AUDI 1.4L и 1.6L FSI, ZT-05166(ZT-04A2025) - SMANN TOOLS. VW, AUDI, VAG Diesel 2.7 & 3.0 V6 TDI Engine Timing Tool Set, ZR-36ETTS64 - ZIMBER TOOLS. Engine Timing tool set VAG - Audi, WV, 1,6/2,0 TDI , ZR-36ETTS137 - ZIMBER-TOOLS. Crank Pulley Counter Holding Tool - AUDI A3, A4, A5,Q5, engine 1,8-2,0 TFSI (CHAIIN DRIVE) ZR-36CHT - ZIMBER TOOLS. 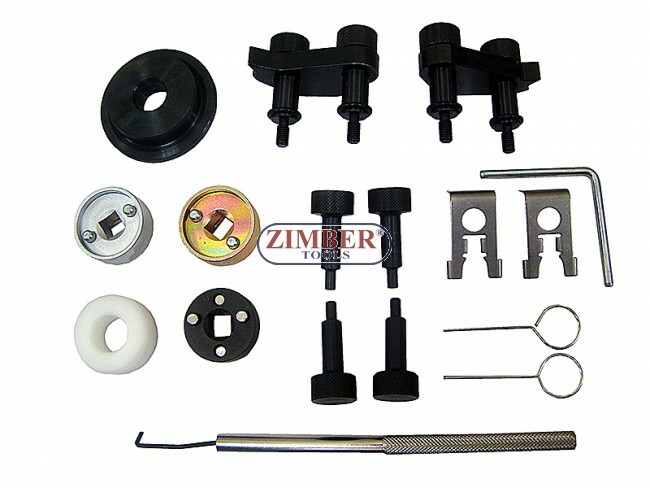 Engine Timing Tool Set for VAG - Audi, VW, 2.4 & 3.2 FSI - ZR-36ETTS138 - ZIMBER TOOLS. Petrol Engine Twin Camshaft Setting / Locking Tool Set - VAG FSI, TFSI 1.2L ,1.4L, 1.6L - ZIMBER-TOOLS. Crankshaft Locking Pin M14 x p1.5, VW, AUDI - FSI, (ZR-36CLP03) - ZIMBER TOOLS. Petrol Engine Timing Kit 1.2 TSI for VW, Audi, Seat, Skoda petrol engines - ZR-36ETTS191- ZIMBER TOOLS. 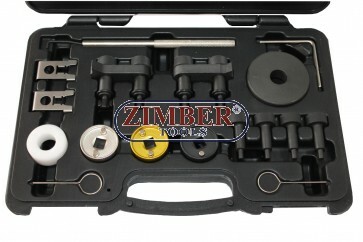 Camshaft Central Valve Tool AUDI 1.8,2.0 4V-TFSI, ZR-36CCVT - ZIMBER TOOLS. ENGINE TIMING SET VAG 1.2 TFSI 1.4/1.6FSI 1.4TSI , ZT-04A2171-SMANN TOOLS. Balance shaft locking tool VAG AUDI,VW,SKODA,SAET - 2.0 TDI PD - ZR-41PETTS13710 - ZIMBER TOOLS. Engine Timing tool set VAG - Audi, WV, 1,6/2,0 CR TDI , ZR-36ETTS229 - ZIMBER-TOOLS. Engine Timing tool set VAG 1.2 TFSI, ZR-36ETTS180 - ZIMBER-TOOLS. ENGINE TIMING TOOL KIT FOR Vag AUDI, VW, SEAT, SKODA 1.0 1.2 1.4 TSI, TFSI - ZT-04A3059 - SMANN TOOLS. Engine Timing Tool Kit For Audi A4 A6 A8 3.2L V6 FSI Chain Engine Set- ZT-04A2126 SMANN TOOLS. Engine Timing tool set VAG 1.2 TFSI, ZT-04A2155 - SMANN TOOLS. Engine Timing Tool Set VAG AUDI SKODA, VW, SEAT 1.9 TDI SDI - ZT-04A2202D - SMANN TOOLS. VW, Audi Camshaft Alignment tool 3.7 4.2 - ZIMBER-TOOLS.